The Southwestern Mission Research Center is an all-volunteer nonprofit organization. We’re committed to the cause of supporting Spanish Borderlands research and education. Our Kino Missions tours introduce people to the history and culture of the Pimería Alta, in the Sonoran Desert of Mexico and Arizona. Proceeds from these tours enable us to sponsor important scholarship on a broader level, assist with publications, and promote education. Furthermore we engage in cooperative restoration projects with the mission communities. Explore our website to learn more about Spanish colonial missions. Most of all you will find out about the work of the Southwestern Mission Research Center. Retrace the steps of Father Kino and the missionaries who followed him. You’ll be guided by scholars and enthusiasts who know and love the region. Most noteworthy they volunteer their time to share their knowledge of the Spanish borderlands missions with others. 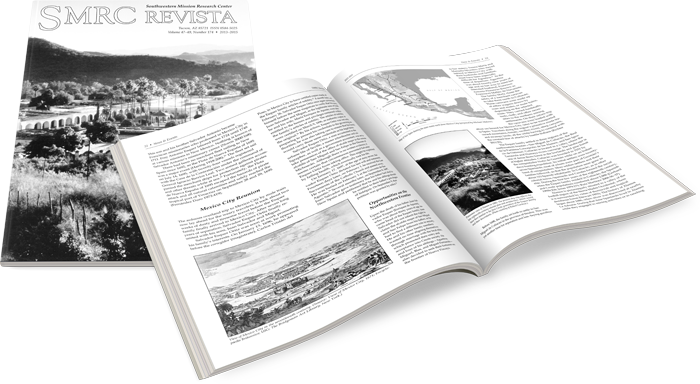 Highlights recent news and events, feature articles, and notes on recently published books and articles pertaining to the Spanish Borderlands.